Mix flour, granulated sugar, butter, lemon peel, lemon juice, vanilla and eggs in medium bowl with spoon until dough forms. Place dough on lightly floured surface. Knead about 3 minutes or until dough holds together and is pliable. Shape dough into a ball. Cover with plastic wrap and refrigerate about 20 minutes or until firm. Heat oven to 350°F. Grease pan with butter; lightly flour 11-inch round tart pan with removable bottom or 12-inch pizza pan. Pat dough evenly in pan. Bake about 35 minutes or until toothpick inserted in center comes out clean. Cool completely in pan on wire rack, about 30 minutes. Heat apricot and raspberry preserves in 1-quart saucepan over low heat, stirring frequently, until melted. Stir in amaretto. Spread over crust. Arrange fresh fruit on top. Drizzle with honey; sprinkle with powdered sugar. Serve immediately, or cover and refrigerate. 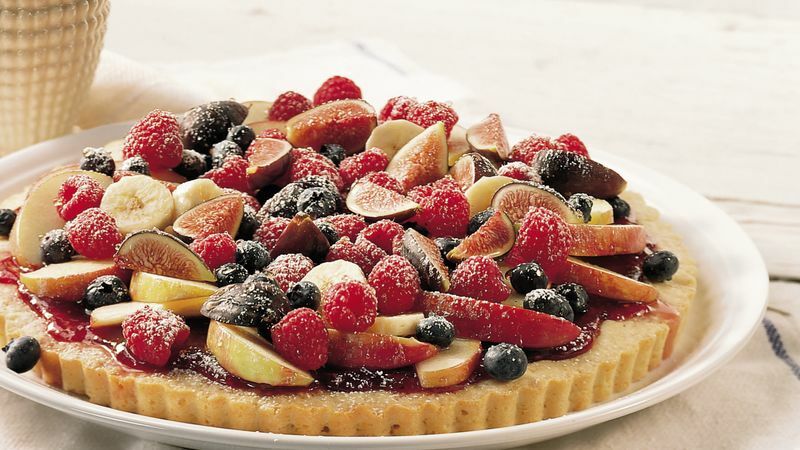 Tortiera Alla Frutta, the Italian name for this dessert that’s featured in Betty Crocker’s Italian Cooking cookbook, typically is adorned with figs and any other seasonal fruits. You can make the delicate pastry well ahead of serving, but wait to spread with the preserves and top with the fruit until close to serving time to prevent the pastry from becoming soggy. The tart is best when served within an hour. The base for this tart is the classic Italian pasta frolla, a rich, buttery pastry dough. Knead the dough just until it holds together and is pliable. If you knead it too long, the butter will soften and the dough will become soft and sticky.